Jade Leyva, 2017 Local Treasures Designee, was born in Mexico City and now makes her home in New Mexico. Her work combines influences from Magical Realism to Pre-Columbian and Postmodernism. On the surface, Jade’s work often appears whimsical, but a closer look leads the viewer into a deeper reflection on her central themes of art, love, unity, and our fragile relationship to Mother Earth. Her series of iconic women is especially intriguing and thought-provoking. In 2013, Jade founded SEEDS: A Collective Voice/Community Seed Mural Project. This project is focused on bringing attention to ancient and organic seed preservation by bringing together students and community members to create murals out of seeds. Community experts teach participants about seed preservation, organics, community nutrition, sustainability, and their connection to a healthy environment. Jade has finished 12 murals with community participation over the last three years. 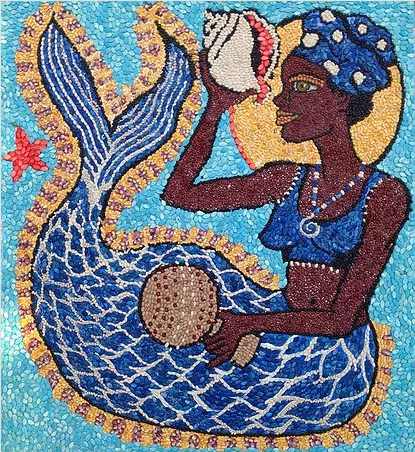 Jade’s work including the “Yemaya Seed Mural” will be on display during the month of September at Tortuga Gallery, alongside “Transformations” a recycled art show. Founded in 2013, Tortuga was designed to be a space for community, art and performance. It is located at the corner of Edith and Pacific. Tortuga will be hosting many events during the gallery shows. I’ve listed them below. Come by and enjoy the friendly, community atmosphere! Please park on Pacific for all events.